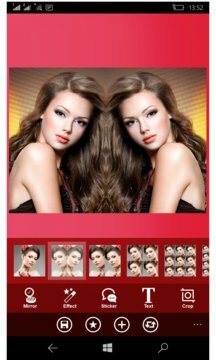 Create a unique variationin your imageswith more than 22+ mirror effects for images to define a new way of adoring yourself in personal photos. Make a stunning and bold definition of images with magnificent effects with simply save and share feature online on your windows device. Compatible with all type of universal windows devices such as tablets, pcs and smartphones. Easy to use functionality makes it very versatile and reliable application to work with. •	Add multiple filters and effects such as artistic, sepia, negative, etc. Resizable collage of 2, 3, 4 and 5 grids available and free form collage also available. Just drag the grid left right to top to bottom to resize it as per your needs. 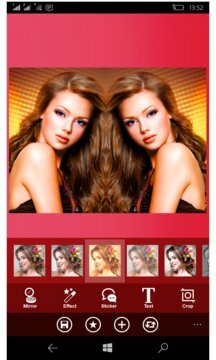 Combined with basic functionality and powerful features this app completes all your requirement from a photo editor application. Free to use functions allows user to take advantage of well polished features of the app to revolutionize mobile photography. Control the opacity and blur levels of your images for making them more realistic and natural. You can also adjust mirror photos in impressive frames, shapes and text patterns. Live cam of the app offers a very unique feature which is directly shoot and edit image option for customizing with images. Start using it today and discover the impressive features of the app! !